A machine-learning approach could help robots assemble cell phones and other small parts in a manufacturing line. As the robot carefully pushes against a block, a computer takes in visual and tactile feedback from its camera and cuff, and compares these measurements to moves that the robot previously made. It also considers the outcomes of those moves -- specifically, whether a block, in a certain configuration and pushed with a certain amount of force, was successfully extracted or not. In real time, the robot then "learns" whether to keep pushing or move to a new block, in order to keep the tower from falling. 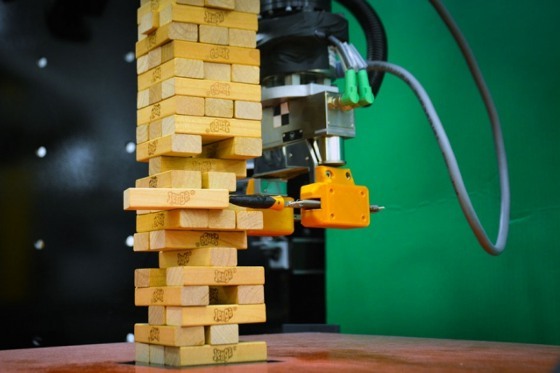 Details of the Jenga-playing robot are published today in the journal Science Robotics. Alberto Rodriguez, the Walter Henry Gale Career Development Assistant Professor in the Department of Mechanical Engineering at MIT, says the robot demonstrates something that's been tricky to attain in previous systems: the ability to quickly learn the best way to carry out a task, not just from visual cues, as it is commonly studied today, but also from tactile, physical interactions. "In a cell phone assembly line, in almost every single step, the feeling of a snap-fit, or a threaded screw, is coming from force and touch rather than vision," Rodriguez says. "Learning models for those actions is prime real estate for this kind of technology." Rather than carry out tens of thousands of such attempts (which would involve reconstructing the tower almost as many times), the robot trained on just about 300, with attempts of similar measurements and outcomes grouped in clusters representing certain block behaviors. For instance, one cluster of data might represent attempts on a block that was hard to move, versus one that was easier to move, or that toppled the tower when moved. For each data cluster, the robot developed a simple model to predict a block's behavior given its current visual and tactile measurements.